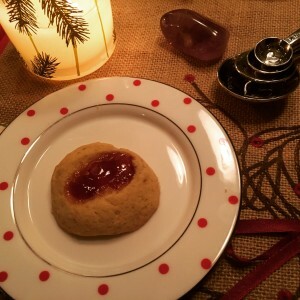 Light and delicious butter cookie with jam. Roll dough into small balls and place on cookie sheet lined with parchment paper. Press each ball with thumb to make print and add a dab of strawberry or raspberry jam. Allow to cool completely. Place on a plate. Savor each bite. Nourish Yourself.